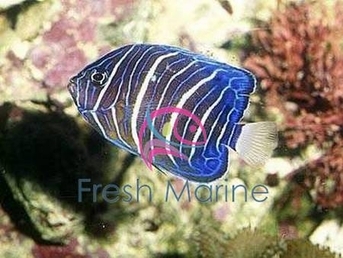 https://sep.yimg.com/ay/yhst-33477391359232/annularis-angelfish-juvenile-pomacanthus-annularis-blue-ringed-angel-fish-6.jpgAnnularis Angelfish Juvenile - Pomacanthus annularis - Blue Ringed Angel Fish ModerateSemi-aggressive70 Gallon11.8 inchesYes, with CautionOmnivore, Greens, Pellet, FlakeIndian and Pacific OceansPomacanthidaeSmall 2" - 3"
The Annularis Angelfish is also known as the Blue Ring Angelfish and the Blue King Angelfish. It is a good candidate for intermediate marine aquarists. The Annularis originates in the Indian and Western Pacific Oceans from Sri Lank to the Philippines. It can be found lurking among caves and hidden areas in coral reefs from 5m to 30m in depth. The pomachanthid family is named after the Latin words �pom� (cover) and �acanthus� (thorn), which refers to its large spine on the lower, rear margin of its gill cover. This spine distinguishes angelfish from butterflyfish. The spine gets easily tangled in nets and injures intruding fish. Many pomachanthidae share a common characteristic that the young are a totally different color pattern than the adults. In fact the young of differing species can look more related to each other than to their parents. The Annularis Angelfish is typical of this pattern. The juveniles stay nearer to the surface than the adults. Juveniles are dark blue to almost black, with white curved bars on the body. The juveniles are often confused with the Goldtailed Angelfish, Pomacnathus chrysurus. The latter is distinguished by its yellow caudal fin. When young, all Annularis are females. The adult Annularis become dark orange to brown with distinctive blue curves and a Annularis just above and behind gill cover. There are also two blue stripes on the face � one through the eye and one below this. The caudal fin is white with a yellow fringe. In the wild, adults can grow to 45 cm. In the wild, the Annularis Angelfish subsists on algae, sponges, zooplankton, coral polyps, shrimp and shellfish. As adult angelfish develop a dependence on sponges, try to obtain a younger specimen which will eat algae and meaty foods, such as mysis and brine shrimp. Julian Sprungs Sea Veggies, Ocean Nutrition Seaweed Selects and standard spirulina flakes are all excellent choices. A high quality sponge based flake food, such as Angel Formula by Ocean Nutrition, should also be used. The diet can be supplemented with small amounts of chopped fresh and frozen crustaceans, shellfish and squid. The Annularis should be fed several times per day, but care should be taken to ensure all food is eaten immediately so that water quality is not impaired. Due to their interest in eating crustaceans, clams and soft corals, they are not a good choice for a reef tank. The Annularis Angelfish is very territorial, so only one of the species and preferably on one Annularis should be kept in an aquarium. A tank size of at least 70 gallons is recommended. Also, the Annularis should not be kept with other angelfish as they will fight aggressively. An angelfish should be introduced last in a community tank. Float the angelfish in a transparent tank to get an indication of compatibility. Possible tank mates include Dwarf Angels, Wrasses, Damsel Fish, Clown Fish, Butterfly Fish, and Tangs. Tangs are riskier tank mates though. The tank should be well lit and have strong waterflow and bubbles to play in. It should have hiding places and live rock for feeding. If your angelfish doesn�t have adequate room, it will be more aggressive. In the wild, Annularis males defend several females in a very small area. Annularis Males and females are not distinguishable from each other. They are egg-scatterers and usually breed at dusk. In the wild, the larvae drift for a month before developing into juventiles. In captivity, the larvae rarely survive. Minimum Tank Size Suggested: The Annularis Angel prefers a tank of at least 70 Gallons. Diet: The diet of the Annularis Angelfish should include vegetables, meats, and angelfish food preparations containing spongiform products. When first introduced, it may need to be offered live foods such as brine shrimp or freshly chopped seafoods to entice it to eat. Breeding: All Angelfish are considered hermaphroditic, and visibly, it is not possible to differentiate males from females.